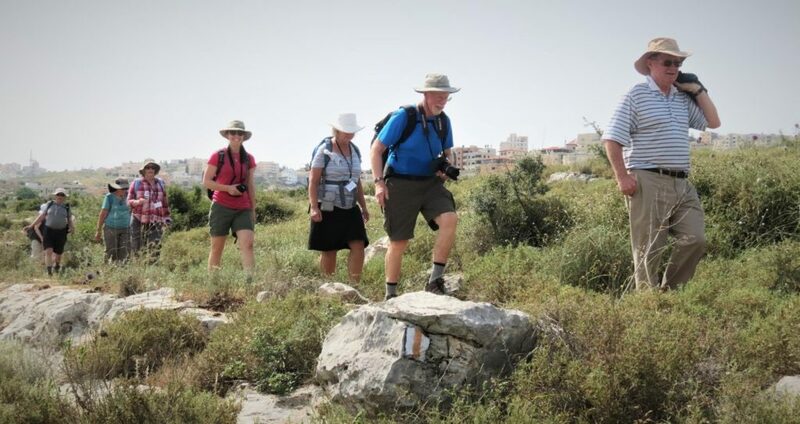 Twenty Peace Pilgrims make our way down the Jesus Trail from Nazareth toward Sepphoris. Twenty Peace Pilgrims make our way down the Jesus Trail from Nazareth toward Sepphoris, the Roman city rebuilt during Jesus’ time. At bottom center a rock bears the white-orange-white stripes marking the path. This is our fourth day of touring, having spent the first two “walking about Zion” to see biblical sites of Jerusalem and area. We have a marvelous group of pilgrims who are bonding well, and are working with an astute and affable Jewish Israeli guide who teams with Nelson Kraybill to interpret and teach. Weather has been the biggest challenge: Israel is in a rare mid-May heat wave. Temps today as we hiked reached the mid-90s Fahrenheit. That wearied us and slowed us down, so we called our bus driver to take us the last two miles to Sepphoris! Because the heat is to continue for a day or two, tomorrow we are not hiking. The bus will take us to sites that all are eager to see: Caesarea Maritima (where Peter shared the gospel with Cornelius), Mt. Carmel (where Elijah confronted the prophets of Baal), and Megiddo (ruins of the ancient city from which we get the name Armageddon). This evening we are at a Franciscan hostel directly across the street from the Basilica of the Annunciation. We are grateful for safety (yes, the country from everything we can see is completely normal and safe) and renewed strength as we take nourishment and rest in air conditioning!